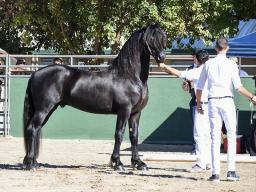 What makes a Friesian a ster? Many things have to come together for success. 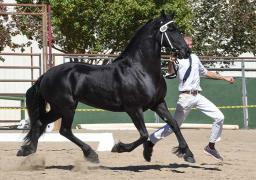 The quality of the horse is the major variable, of course. No one can change basic conformation. We can, however, change several other things in a horse who will be presented at a keuring. Movements are counted twice in judging and walk and trot are two of the things than can be changed! Our own CROWN mare, Elysee, received a 6.5 once on her walk. Then, a year later, she received an 8 on her walk, scored an 80.5 on her IBOP and received the titles of CROWN mare, mare champion and keuring champion at the Hanford keuring where there were over 30 mares total! Many other factors influence scores, like conditioning/muscling, coat, and feet. 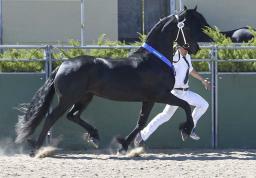 Runners can also impact how a horse shows at their keuring. In 2016, 4 out of 5 of our adults presented for ster, did make ster! In 2017 we presented 7 adults for ster and all 7 received ster with one 3 year old mare receiving PROVISIONAL CROWN. We have all of the above. It takes A LOT of experience and a lot of time to get a horse to look and move at their very best. We are offering keuring prep for a small number of horses for presentation in 2018. Board $550 a month which includes specialized diet and keuring presentation with approved runners.